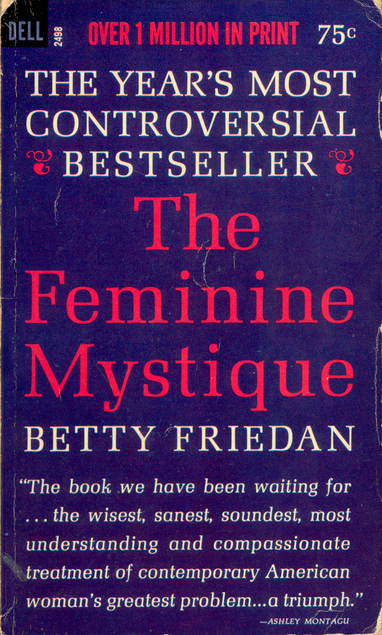 We’re less than a month into 2018, and I already have a contender for best nonfiction book of the year: The Feminine Mystique by Betty Friedan. And it will probably bring back my end of the year category, “I can’t believe I waited until this year to read this book.” I have, after all, been hearing about it for…well, ever since I was old enough for my mom to start talking about it, so I’d have to guess early teens. I probably should have read it sooner–or maybe now was the perfect time, for it to feel scarily relevant. In 1963, fifty-five years ago, Betty Friedan wrote her ground-breaking book about “the problem that has no name,” why so many educated, intelligent housewives with good husbands and beloved children still felt deeply unhappy. She explores the cultural pressures forcing women to stay in the home–convincing them that’s the best and most noble place to be–and why this is having terrible outcomes. She looks at relevant history, from the suffragettes to Freud, and gets in-depth about the cultural norms of her time and how we got there. It’s hard to believe that most of it is anything I didn’t know on some level before–and yet it still felt mind-blowing. It’s like a painting you’ve been looking at forever, then moving two steps to the right and seeing a whole new pattern emerge from the changed angle. Friedan really did bring new ideas (for me, anyway) about the pattern of women’s place in society, from the suffragettes of the twenties, to the “working girl” of the thirties, to Rosie the Riveter in WWII, and then, somehow, swinging backwards to June Cleaver in the home in the fifties. Those were dots I’m not sure I ever put together, and it puts a different shape on the twentieth century for me. Three major concepts emerged for me. “The problem that has no name” is the vague, indefinable malaise women experienced because they felt no purpose–or at least, not enough–by being housewives. That need for a larger purpose is easily applicable whether you’re a housewife or not. The problem is caused for housewives, in part, by the feminine mystique (and I struggled to remember she didn’t mean her book when she referenced it, since she’s so iconic now!) The mystique is the idea of what a woman is supposed to be, how she is meant to behave and interact with the world. And isn’t that still an issue today??? Third concept, a little more specific, that really struck me was her chapter on housework expanding to fill the time available. When women had nothing to do, they started vacuuming daily and washing the sheets twice a week–and feeling obligated to do that. Again, an idea with much wider application–because isn’t it easy for simple tasks to expand when time is available (so it stops being available), and so easy to feel obligation towards perhaps superfluous tasks. Little wonder everyone feels so busy. The biggest thing that hit me, perhaps, was that Friedan was writing about exactly the same era that, shall we say, certain segments of the population rather vocally think we ought to return to. You know, those halcyon days of the 1950s, when everything was so innocent and idyllic. Friedan describes that same era and makes it sound positively hellish. Of course, people often clarify that they don’t mean that part of the 1950s (sexism, Jim Crow laws, fill in as you will) but how exactly you can get the other part back and functioning without the rest…? Other people have pointed out this problem with nostalgia, of course, but anyone saying it now is also looking back–Friedan was writing from the trenches, and that makes a difference. Ironically enough, I started listening to Friedan on audiobook while doing my annual January decluttering and cleaning. I noted the irony even as I did it. But it’s my apartment, with my clutter, that I’m paying for (apartment and clutter both) from my earnings, so perhaps Friedan would approve. And I don’t know that she was ever exactly against women keeping house, and certainly not against caring for children. Neither am I–it’s just when women aren’t allowed to (or are pressured out of) doing anything else that my feminist hackles rise. Now that I’ve finally read The Feminine Mystique, I plan to reread Sheryl Sandberg’s Lean In soon. I think Friedan likely gave me a whole new angle to read it from. I LOVED that book! Read it when I was a younger woman and it was eye opening to me, too. She ignited the first wave of the feminist movement with it. It’s been many years since I read it. Will have to go back and re-read it now. I like your idea of coupling it with a more recent book that’s somewhat on point with this subject, Lean In by Sheryl Sandburg. May go ahead and read that one, too. It’s good to be reminded that the movement for equality for women and, really, more equitably defined roles for both genders, is an on-going one.